After years of poaching of these unique creatures for their horns and other body parts, the IUCN formally declared West African Black Rhinos as "Extinct" in 2011. The massive West African black rhinoceros (Diceros bicornis longipes), a subspecies of black rhinoceroses of Africa, that roamed freely in the wild only a few years back, was declared extinct by the International Union for the Conservation of Nature in 2011. The creature, weighing around 800 to 1,400 kilograms, had a height ranging between 1.4 and 1.8 meters, and a body length between 3 and 3.75 meters. The extinct West African black rhino, like other black rhinos, had a pointed upper lip, in contrast to the squared lips of its white relatives. Of the two horns of the rhino, the foremost one was more prominent, with a size ranging between 0.5 and 1.4 meters, while that of the shorter one reached between 2 and 55 centimeters. The rhinos also possessed a thick-layered skin to protect them from sharp grasses and thorns. The West African black rhinoceros was a herbivorous browser that resided in habitats with thick scrubs, bushes, and woody plants. These creatures also preferred quality over quantity, and populated areas where food quality was better. During the dry seasons, they were attracted to feed on leafy species while in the other seasons, woody plants were their favorite food sources. Only a century ago, the four subspecies of the black rhino, including the West African black rhino, inhabited a wide range across sub-Saharan Africa. They lived in a wide variety of habitats including scrublands, montane forests, and savannas, as well as tropical grasslands. Today, from around one million black rhinos of all kinds at the beginning of the 20th Century, there are only a few thousand remaining in Africa at present, of which the West African black rhino is no more. Historically, the extinct West African black rhino itself had a fairly large range across southern and western Africa. It was the northernmost of the black rhino subspecies, having a historical presence in the African countries of Chad, Cameroon, Sudan, South Sudan, and the Central African Republic. However, the last known range of this animal was though to be in Cameroon, from where it disappeared altogether. The West African rhinos foraged at night, and at the twilight of dusk and dawn. For the rest of the day, they avoided the hot African sun by taking refuge under some kind of shade. These rhinos also loved to wallow in the mud, as the mud coating protected their skin against the sun and also discouraged bugs. They were solitary creatures, and only the mother-child bonding served as long-term social relationships, which lasted for long as calves did not leave the mother until they were three years old. The rate of reproduction was also quite slow, as females reproduced only once every two and a half years. The sharp sense of hearing and smell of the rhinos also helped them locate mates and offspring in the wild African landscape. The black rhinos of Africa have been classified into four distinct subspecies. Namely, these were the Diceros bicornis ssp. bicornis, Diceros bicornis ssp. longipes, Diceros bicornis ssp. michaeli, and Diceros bicornis ssp. minor. This classification is based on the distinct eco-types or sub-regions of Africa occupied by these subspecies, respectively. The West African black rhino was the common name for the Diceros bicornis ssp. longipes subspecies of African black rhinos, and was primarily distributed in the western and central parts of the continent. The fate of the West African black rhino appeared to be doomed when the European settlers first began to arrive in Africa. Hunting for sport and destruction of rhino habitats to make way for human settlements became the norm of the day. From a million black rhinos at the beginning of the 20th Century, their numbers shrunk to only 70,000 by the 1960s. The second wave of rhino killings began in the early 1970s, when poachers greedy for rhino horns began hunting down these creatures in a merciless manner. 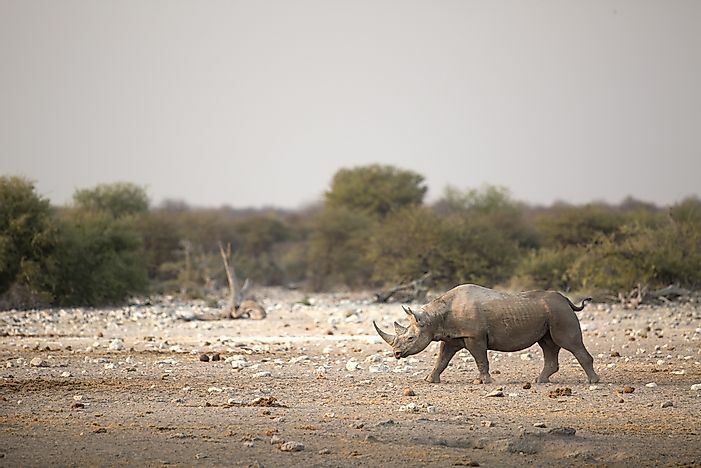 Not only were those black rhinos living outside the conservation areas almost completely wiped out by illegal poaching, but those inside protected areas like national parks and reserves were also not completely spared. Between 1970 and 1992, nearly 96% of black rhinos were eliminated, with the West African black rhino suffering the worst fate among the four subspecies of black rhinos. Rhino horns were prescribed in traditional Chinese medicine as a cure for liver problems and fever. This resulted in a large number of rhinos being killed over the years for medicinal purposes. However, with widespread global protests and trade bans in Asian countries on rhino horns in the 1980s and 1990s, the mention of the rhino horn powder was removed from the Chinese pharmacopia, and demand for rhino horns dropped considerably. However, things worsened again when, in 2008, 83 rhinos were poached, and the numbers of kill exhibited increasing trends. What was the reason for this sudden growth in rhino poaching? Many believe it was related to a certain rumor in Vietnam which claims that a Vietnamese politician’s cancer was cured by use of rhino horn powder. The rise in the number of rich families in Vietnam over the last five years has rendered many wealthy Vietnamese millionaires capable of purchasing the highly priced rhino horn powders. With cancer mortality rates in Vietnam being extremely high (73%), some people there are ready to go to any extent to cure cancer, even if it means wiping out an entire species from the face of the Earth. What is worse, a section of conservationists also believe that rhino horn powder in Vietnam is added to the alcoholic drink of millionaires as a cocaine-like party drug or a virility enhancer. All of the above factors thus contributed to the disappearance of the West African black rhino from the face of the Earth. Much effort was made by the African government and international wildlife conservation organizations like World Wide Fund for Wildlife, as well as other governments and non-governmental organizations from across the globe, to curb the disappearance of the West African black rhinos. However, the efforts that came too late were no match for the rates of death of these majestic creatures at the hands of human greed and indifference. Currently, attempts are being made to conserve the remaining black rhino subspecies, all of which are critically endangered. Establishment of new protected areas, the translocation of rhinos to more secure locations, the strict monitoring of the rhino habitats, and more stringently enforcing laws to stop the illegal trade in rhino body parts are all measures which might keep the remaining black rhinos alive in the future. After the last extensive survey for evidence of living West African black rhinos was made in the creature’s last known range of Cameroon in 2006, the hard facts about the complete absence of these animals were uncovered. No signs of the rhino in the form of live animal sightings, dung, spoor, or signs of feeding were detected in the region. This compelled the International Union for the Conservation of Nature to declare the West African black rhino subspecies to be extinct. The loss of the West African black rhino has opened our eyes to the unfortunate state of affairs prevailing in Africa, where poaching often continues unabated and government measures are unable to curb the rapid disappearance of species. It also reveals the high demand for rhino horns in countries like Vietnam and China, which encourages poachers to risk their lives to kill these animals, even in protected areas like national parks and bio-reserves. Today, we might also lose the Northern White rhino (Ceratotherium simum cottoni) which has only one surviving male, named Sudan, who is being kept under armed guard day and night in order to save him and to use his sperm to fertilize the handful of female White Northern rhinos remaining. The Javan rhino of Southeast Asia has also disappeared in recent times. All of these disappearances speak volumes about mankind’s lack of concern for nature and living beings, and necessitates an urgent response involving coordinated efforts by governments, environmentalists, conservationists, and, most importantly, the common man, to save the remaining rhinos of our world.